The Clark Tavern Inn Bed and Breakfast, set in a beautifully restored colonial tavern, offers luxurious, unhosted guest suites for life's weary travelers. The inn is perfectly located in a tranquil setting in Hadley, five minutes from the lively college towns of Amherst and Northampton. Each of the Clark Tavern Inn's spacious guest rooms is perfectly appointed with a queen bed, cozy reading chairs, TV with VCR, and a private bath. Our most romantic rooms have working fireplaces and canopy beds. The inn's tranquil surroundings include a inviting screened patio, beautiful perennial gardens, and a built-in swimming pool. Rates range from $85-125. A light self-service, continental breakfast is provided. In addition, a fully equipped kitchen, stocked with a selection of complimentary beverages, is available for guest use. 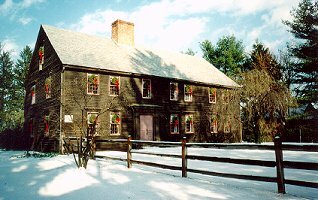 The Clark Tavern Inn Bed & Breakfast is located in a tranquil setting in Hadley, Massachusetts. We are just two miles from the lively college towns of Amherst and Northampton in Western Massachusetts.